The cloud software Panther Pricing generates automated price reduction recommendations for the retail trade. By using the software, price markdowns can be reduced by an average of 3% points. With the help of intelligent machine learning technology, the core questions of optimal price reduction can be answered and gross profit-optimized prices can be generated – individually for each retailer, for each article. Those who want to realize the great potential of digitization in retail should focus on the more intelligent analysis and processing of available data in order to generate a better basis for decision-making. This is where the main potentials, which have often been untapped so far, can be found. At the same time, the process of price reduction is the area where the most important decisions are made that cause the 20% price markdowns customary in the industry. The greatest earnings potential of the retail trade lies in the area of price markdown optimization. The ability of retailers to leverage these potentials will play a decisive role in determining future viability, both online and offline. The Dynamic Pricing Software, Panther Pricing, is aimed precisely at this approach, because it allows retailers to carry out data-driven price optimizations that are individually adapted to the respective performance, inventory and target situation of the retailer. The high price markdowns result from the sum of many errors in the reduction process. This is due to the complexity of determining an ideal price reduction. Here, clear goals, current article performance, inventory situation, time, seasonalities and detailed knowledge of the effect patterns of reductions in dependence on many factors have to be brought together in a coordinated manner. The complexity is immensely high. Without the use of artificial intelligence and the evaluation of large amounts of data, no progress can be made here. This requires special new approaches to evaluations that cannot be found in merchandise management systems. What the responsible buyer has the choice between flat-rate reduction according to age structure or with experience and gut feeling on article level to reductions. Both leads inevitably to many errors of the individual reduction decision on article level and thus to much optimization potential. Panther Pricing helps to solve the dilemma of suboptimal decision bases and therefore often wrong reduction decisions. This is exactly where the software comes in and enables every retailer to make the right price decisions and thus achieve the best possible gross profit from sales. In addition, the required process effort of price reduction is reduced to the essential through digital support. How does Panther Pricing work? Through the use of intelligent machine learning technology, Panther Pricing answers the key questions of optimal price reduction:”Which articles have to be reduced how much in order to achieve an optimal gross profit? How Panther Pricing helps to optimize the entire process of price reduction can best be explained using the challenges of ideal price reduction in the process. The necessary basis of any good price recommendation is a clear goal. Thus we first record clear target parameters in the system that the user intends to achieve. Panther Pricing helps to identify those bums articles during the off-season and generates an ideal reduction proposal in order to achieve the defined targets in a gross profit-optimized way. By changing settings, the volume of price change proposals can be set to. An important system-side background analysis here is the generation of a reliable sales forecast for each individual article, which is carried out with the help of machine learning technology, taking into account the company seasonalities. The comparison between target and forecast forms the basis for the last determination of the reduction rate required to eliminate the difference in sales. Et Voila – the ideal price can be determined for each article at any time depending on the defined target. The price suggestions can be flexibly sorted and filtered by the user in the result mask and thus easily checked and corrected if necessary. Subsequently, the data can be exported as an Excel export file or directly back to the merchandise management system via full system integration. 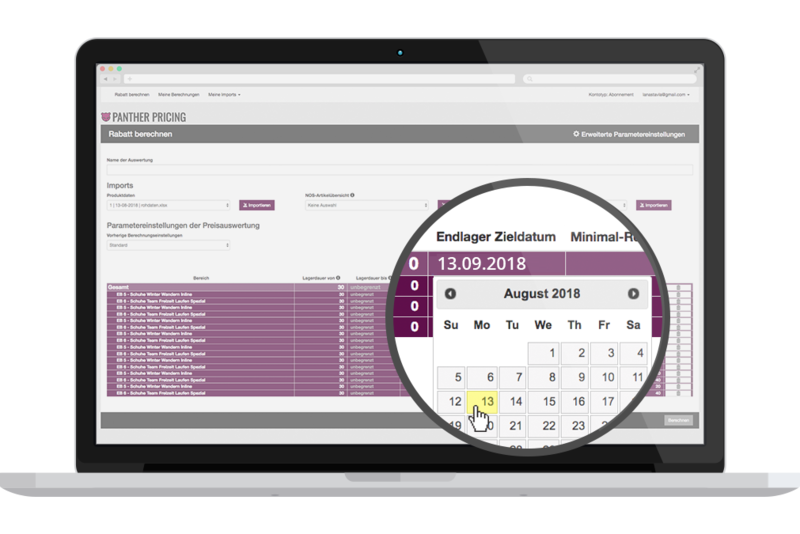 For the first time, Panther Pricing offers detailed information on the expected price markdowns required to achieve the target through comprehensive reporting functions. This data is provided and can be evaluated in at brand and product group level or per segment. With Panther Pricing, this information is already available at a very early point in the season and can therefore be fully used for upcoming purchasing decisions. This makes the use of Panther Pricing extremely flexible, as it can be used to generate ideal price proposals whenever a reduction is imminent. There is no need to change the user processes. Nevertheless, it makes sense to reorganize the processes when introducing them, since the price reduction process can now be carried out with significantly reduced effort. A possible ideal complement to Panther Pricing is the combined use of ESL technology. In this case, ESL acts like an optimization booster. This enables cycles and price changes to be kept as short as possible and permanent automated corrections to be made. When Panther Pricing is used, the addition of both systems leads to an additional gross profit leverage of 3% points through fully automated control and subsequent correction of price reductions. The new Fashion Hang tags now finally make it possible to use them fully in the fashion retail trade. 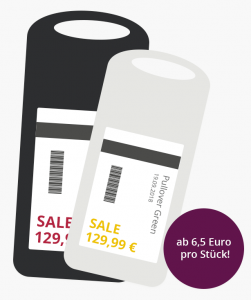 With electronic price tags on the goods, all redrawing work can be carried out automatically in the shortest possible time. What does Panther Pricing bring? Panther Pricing originates from consulting projects tackling the problem of price marke downs. Retailers have closely been involved druing the development process and therefore Panther Pricing is developed for the retailers and is intuitive to use, easy to integrate and absolutely effective in ist gross margin impact. The system integration of Panther Pricing is not a big integration project – we have already integrated most common ERP systems in retail. Further the Panther Pricing team supports new customers by providing comprehensive integration consulting and various service level offerings to determine the appropriate target parameters and deployment cycles. Naturally, this is done taking into account various company-specific strategic framework parameters in order to successfully implement Panther Pricing from day one. Increase in earnings: through significant reduction in price markdowns Immediate increase in earnings 3% points. Cost reduction: automation of the reduction process significant cost savings cost saving. Improvement of liquidity: Optimizes the achievement of final storage Target inventories Reduced Ø Inventory Sustainably increases liquidity. The data on which the Panther Pricing evaluations and Machine-Learning algorithms are based can be divided into 3 segments.